Shoso Shimbo has been invited to present papers based on his Masters exegesis. Both papers will be published and will be available at some stage. 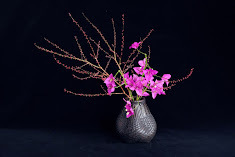 The field of free style Ikebana today has expanded to incorporate many themes in common with contemporary Western art, in particular with installation and assemblage. From 1980 to 2001 Hiroshi Teshigahara explored the possibilities of installation through his bamboo works. Focusing on his unique attitudes toward the natural materials and his creative strategies of repetition and accumulation, this paper agues that his site specific installations fall within the context of the contemporary Western art, moving beyond the underlying Japanese cultural and spiritual traditions.